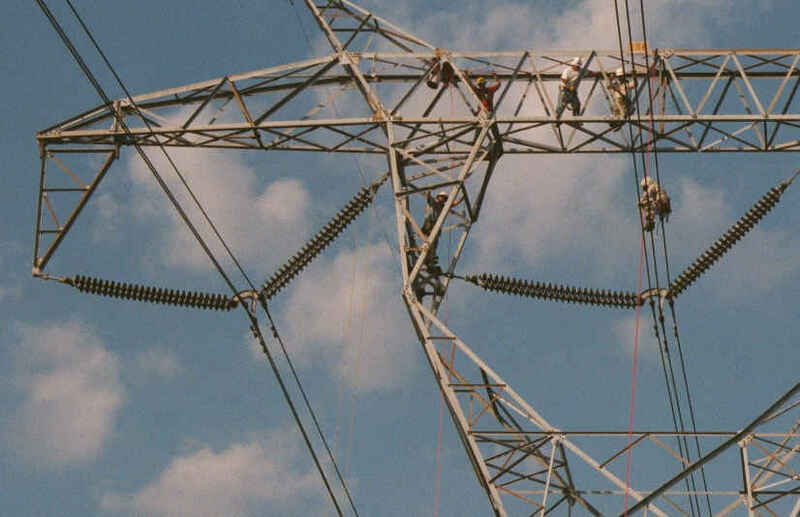 CONTRACT WORKSHOPS designed to be held at YOUR facility on YOUR towers and lines. Prices vary according to geographical location. 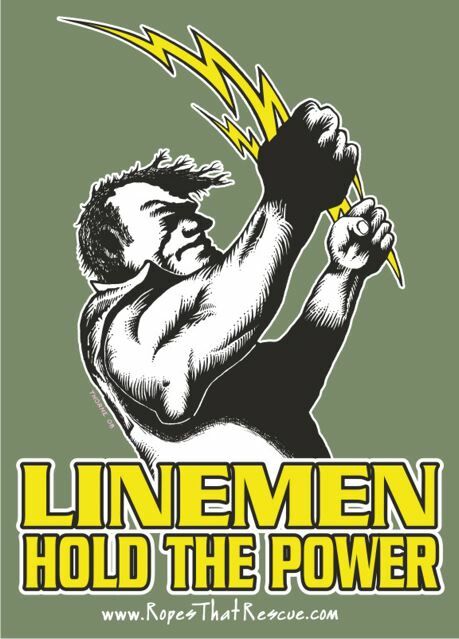 HANDS-ON TRAINING for transmission linemen and othere involved in electric power transmission. This training includes but is not limited to the recent OSHA mandated 100% fall protection standard under 1910.269. 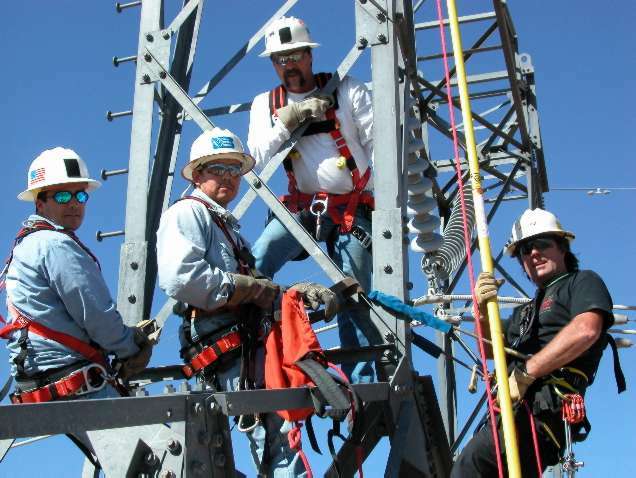 As of April 1, 2015, all transmission linemen must have a means of climbing a tower with full tie off. No more "free" climbing or "qualified climbers". 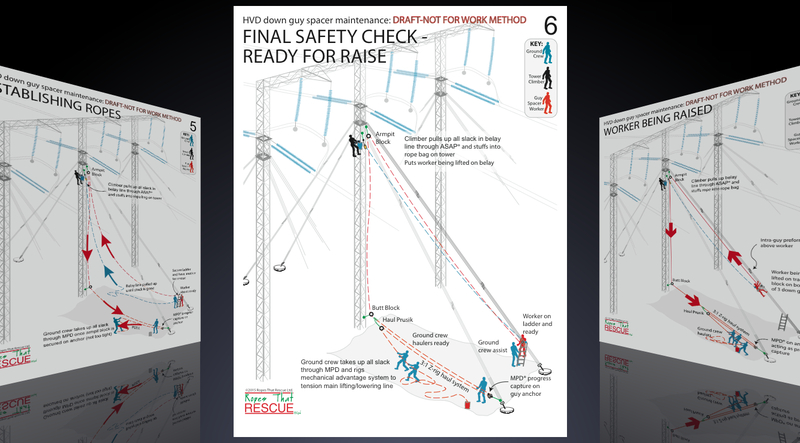 AT RTR, this training is NOT provided by those unfamiliar with transmission lines and tower, but by a transmission line rescue specialist who has worked transmission since the early 1970's. 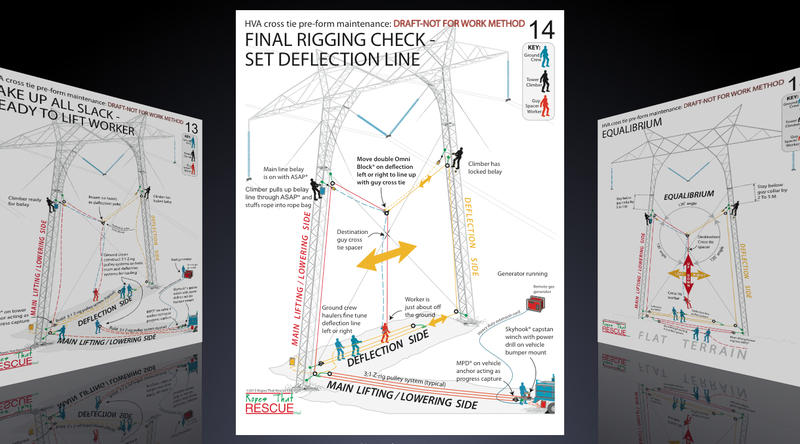 WRITTEN PROCEDURES for your work method on power lines. Ropes That Rescue will write and meticulously illustrate with detail the procedures for the work method. See below example of our work for 1) a major western electric utility, and 2) a southern line contractor through Quanta Energized Services. RTR will take blueprints of your towers and structures and design the procedure to fit your needs. The procedures and associated illustrations will be comprehensive and will provide the groundwork for work method involving rope. A good ilustration is worth a thousand words. training and the written procedures for this important work. All illustrations are copyright© RTR 2015.
towers from plans provided by their clients so that accuracy and detail are preserved in the drawings. We understand the differences between standard rope rescue, industrial rope access, technical rescue training techniques and equipment and those used in the 'tower trades'. RTR instructor, Reed Thorne, has been working in and around the towers for much of his life. His work with tower rescue training, including high voltage power transmission linemen, is unsurpassed anywhere in the world. Even the History Channel extensively documented Reed's rescue techniques in their series Suicide Missions presentation "High Voltage" filmed with Georgia Power linemen on energized 500,000 volt power lines! No other training company can bring to the table the depth of knowledge in rescue from towers of any kind like RTR. These simple, yet effective technical rescue techniques taught in several RTR programs incorporate the latest developments in lightweight, multi-function equipment that workers would be normally using to provide work positioning and fall protection at elevation. At the conclusion of our training, participants will be better prepared to deal with emergencies they may encounter during routine work assignments. RTR industrial rope access training focuses on job-specific techniques and extensive hands-on practicals to provide tower workers with the means for both self-rescue and more difficult evacuation of injured coworkers. 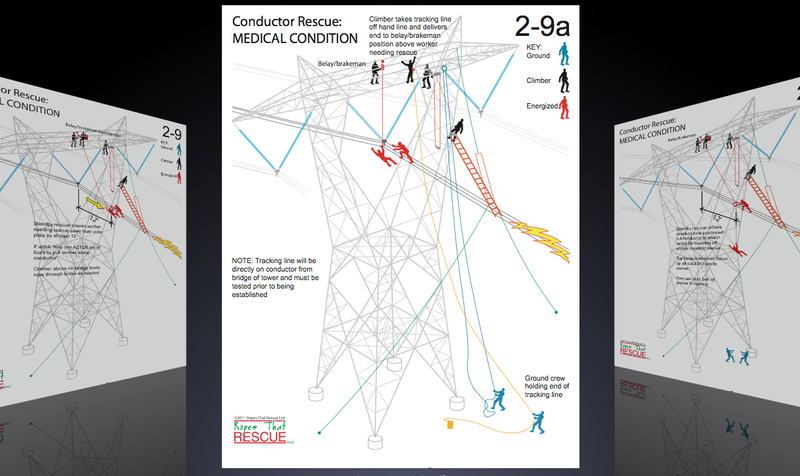 In these provocative courses, first responder patient assessment and stabilization is taught so that tower worker or lineman can better respond to medical emergencies involved at elevation. Spend between three to seven days learning the techniques from Ropes That Rescue expert instructors either at your facility in four customized contract courses or join us for the annual "open enrollment" Tower Rigging Workshop at a US host facility. See black box below for more information. Instructor, Reed Thorne, of Ropes That Rescue Ltd. has just recently completed the first-ever, feature-length multi-media training DVD series "TOWER RESCUE for Emergency Responders"! (Available from Highline Productions) In the near future, the second series "TOWER RESCUE for Tower Workers" will be completed. 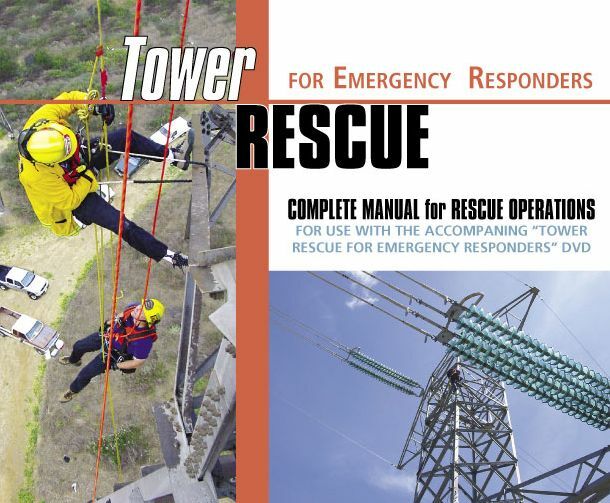 A full color, 200 page Tower Rescue manual (see cover) accompanies each DVD. Who else would you trust?" 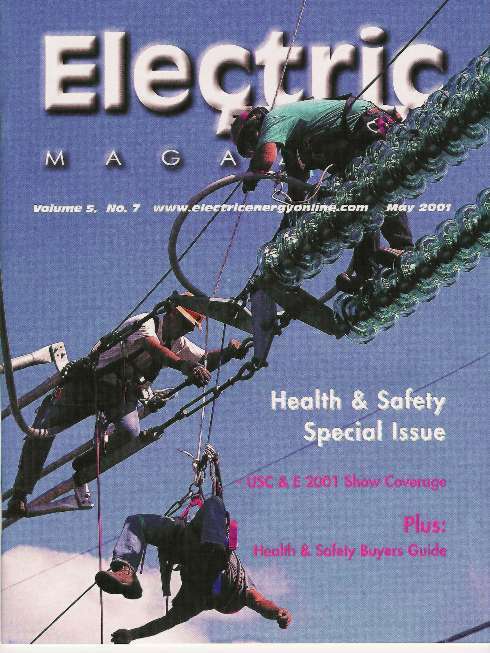 Ropes That Rescue seminars have been featured on the covers of both TRANSMISSION & DISTRIBUTION WORLD, UTILITY SAFETY and ELECTRIC ENERGY magazines. Reed Thorne is also a speaker at many conferences in the power delivery industry including EEI, ESMO 2000, 2002 and T&D World Expo 2000. 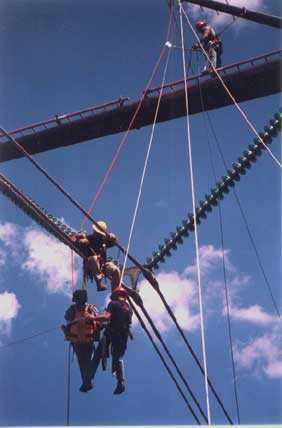 VERMONT ELECTRIC TRANSMISSION CO linemen training on one of their 400 KVDC tangent structures during a Ropes That Rescue 3 day workshop on transmission line rescue. Workshop was held at Island Pond in August 1999 and again in September 2000. 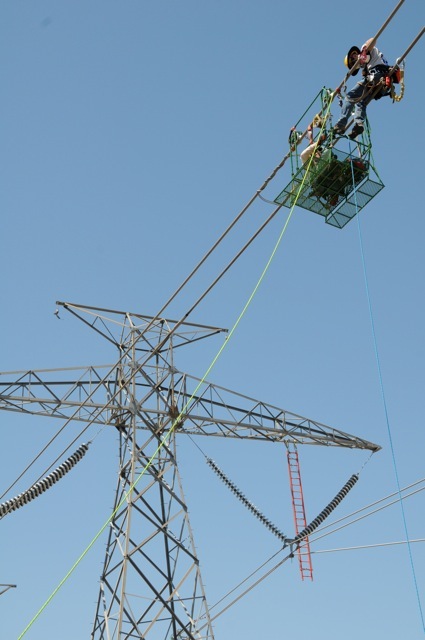 Baltimore Gas & Electric linemen use a vertical lift full C spine immobilization device to lower a simulated traumatic injury worker off an energized 138kv double circuit transmission line. Photo taken from adjacent Condor bucket truck.